Bhatkal, June 07, 2017 : Seven persons critically injureded in volvo bus- truck collision on National Highway at Belake in Bhatkal on June 07, Wednesday morning. 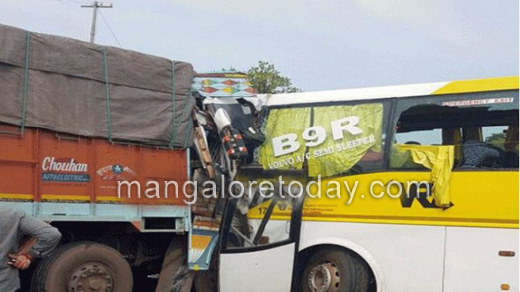 Sources say a private volvo bus of VRL Roadlines plying from Bhatkal towards Mangaluru collides with a loaded truck on National higahway in Bhatkal. Due to the impact of collision seven persons includung the driver were critically injured . All the injured are being treated at Bhatkal government hospital. The front portion of the bus is completely mangled. Hope the injured are recovering . Recklessness!!!!! !